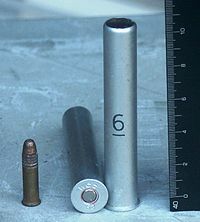 ^ アメリカ合衆国特許第730,308号 - Projectile for smooth and rifled bores. ^ EP 1688700 - Intermediate part for a shotgun slug or ball. ^ George C. Nonte. Firearms encyclopedia. Harper & Row. p. 76. ISBN 978-0-06-013213-2. "A shotshell which has been cut partially through forward of the head in hope of reducing shot dispersion." ^ Julian Sommerville Hatcher (1935). Textbook of firearms investigation, identification and evidence: together with the Textbook of pistols and revolvers, Volume 3. Small-arms technical publishing company. p. 61. ^ Concealed Third Fastener - Hallowell & Co.
^ Churchill Quick-Sighting Rib - Hallowell & Co., Inc.
^ Swamped Rib - Hallowell & Co., Inc.